“The evolution of the internet is an extremely complex topic. Sometimes it is helpful to find broad patterns that make it easier to understand. One simplifying pattern comes from two types of actions Internet users take: pull and push. The Push vs. Pull elements of the Internet are great overarching concepts, and can help us make some sense on what the Internet is collectively good at versus where it’s still improving. The Pull Internet works at it’s best when you have a very specific goal in mind: “I want to know who played Mike’s character in Breaking Bad.” “I need to purchase an airline ticket on this date to get from X to Y”. There isn’t much creativity at work here; in the case of your airline ticket, you know what you need and now you’d like to pull the itineraries, prices and trip details available to you. Hence, pull is dominated by effective search: Google, Amazon, Expedia, and Yelp are all examples of pull done well. Push, on the other hand, works best when you don’t have a goal in mind, and want to spend your time looking at interesting things and/or sharing your own posted contributions. When you’re on Instagram – a crown jewel of the push Internet – you don’t have any specific browsing goals: content comes to you. Facebook, Snapchat, Twitter, have also figured out important aspects of this dynamic. In other words, the pull era of the Internet solved retail-as-logistics pretty effectively- but retail as discovery remains unsettled, even well into the push era. The wrinkle is that the push model of social posting isn’t quite right either: when your news feed is entirely dictated by what’s being pushed at you by others, it’s hard to effectively narrow in on posted content that is relevant to your task at hand. Retail discovery, in other words, is wedged somewhere between push and pull: you don’t have a specific goal, but you do have a vague goal. Hence, aimless browsing of social feeds isn’t going to get you very far: there’s no easy way to signal your intent. Enter Pinterest. Unique among the major social networks, Pinterest is foremost an idea-discovery machine. If you have a vague goal in mind, from the ordinary (I need to cook breakfast) to the complex (I need to plan a wedding) and are looking for specific ideas for how to attain that goal, Pinterest is a far more useful platform than Google, Facebook, Twitter, Instagram, or anything else I can think of. It combines the best of pull and push: you search for a basic category (e.g. “wedding ideas”) that signals your vague intent, and in response you get a large number of specific ideas that are pushed at you from your social graph and beyond. The vague intent stage is especially important to online retailers, because that’s where there’s the most room for elastic growth. If I signal my specific intent to purchase something (“YUL-YYZ round trip flight, March 10-12”), I’ve already decided that I will make a purchase; the question is from which vendor. It’s effectively a zero-sum game that comes down to price and convenience (think Expedia vs. Kayak vs. specific airline websites). The vague intent stage, though, is very different: I might make a purchase, if I feel particularly inspired or find something I really like. It’s a higher level of the purchasing decision funnel, and a level where neither Google-led pull services nor the Facebook-led push services have it quite figured out. So if Pinterest is really the sweet spot between push and pull for retail discovery, what’s their next move? Although their user engagement metrics are spectacular, the jury’s still out on exactly how they can best monetize their users: promoted pins are nice, but it seems like small fries to me relative to their potential. 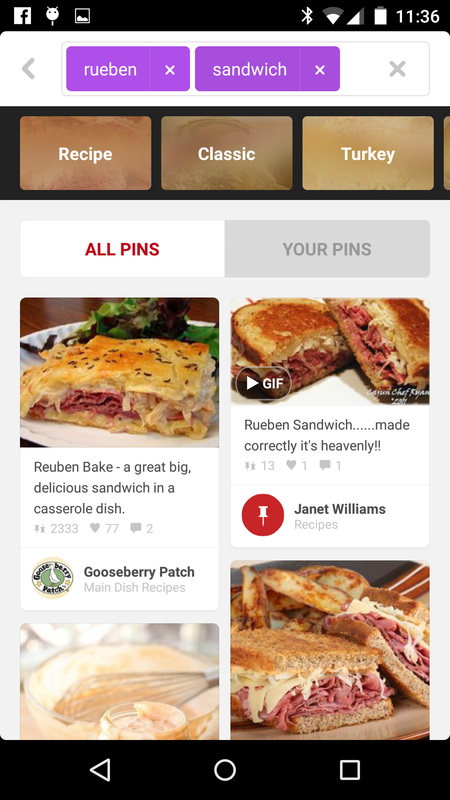 A few weeks ago, we got a clue: Pinterest is officially teaming up with Apple to create ‘App Pins’, a long-awaited social graph-based alternative to the App Store. Although this led to some speculation around whether or not Pinterest is trying to take a bite out of the mobile app market, I think they’re up to something else entirely. Much like Apple released the fingerprint sensor with a few basic use cases (pretty much just unlocking your phone) before eventually revealing its real purpose (Apple Pay), I think Pinterest is up to something similar. I’d bet that App Pins is an experiment – an MVP designed to test user behavior – leading up to something bigger. And I’ll bet that something is third party in-app purchases from within Pinterest itself, facilitated by Apple Pay. Think about it: what better way to test your native ability to manage discovery-based, third party transactions than to try it out with the App Store, especially in collaboration with Apple themselves? It seems to me that the biggest factor holding Pinterest back right now is simply the fact that they’re not yet able to do in-app purchases: if a user with a vague goal browses Pinterest for an hour before finding exactly what they want, then purchases that item through a Google search in 5 minutes, Pinterest has done almost all of the ‘work’ but given up a lot of the monetization potential. In-app purchases solve that problem, and give them a much more powerful platform to monetize the top of the funnel than just through promoted pins. Just like third party vendors who use Amazon’s search, warehousing and logistics scale to streamline the bottom of the funnel, a fully-integrated Pinterest would do the same to the top of the retail funnel which is (as of now) mostly unclaimed. For 21st century online retailers like Zappos or Frank & Oak, this hints at an ‘extended front door’ model that’s a little bit similar to the relationship between Buzzfeed / HuffPo etc and the social networks. Online retailers may soon realize that they’re really all third party clients of the Giant Social Discovery Funnel, whether they knew it before or not; the retailers who embrace this realization, rather than fight it, could well be the ones who win. Whether that Giant Social Discovery Funnel turns out to be Pinterest or somebody else, we’ll see. But in my opinion, Pinterest certainly has the right ingredients so far.